"All your plots wrecked, no alleyway assassins, no desperate adventurers determined to be your errant knights. Yes Lady Mary, it is all over! No more fools will stumble into your clutches. Now the world’s eyes are elsewhere!" Indeed. But I wish it weren't so. Farewell to this beautiful, consuming play. Farewell Harriet Walter. 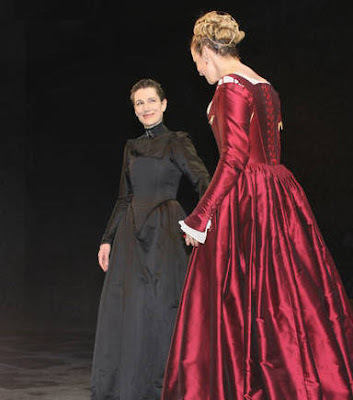 Farewell Janet McTeer. May we meet again soon, whether on Broadway or in your England. I'm sad already. But mostly very, very excited!!!! Visited NYC three times this summer to see the show--wish I were there today. Very sad to see it close. If you are going one more time, please post a full report! how could you let this happen?!?! ?